Throughout the car purchase process, a lot of data and information is gathered from customers who interact with your dealership through a number of touchpoints. Name, number, cellphone, address and email are just a few of the ever-growing bits of information gathered from customers beginning their consumer journey. Collecting this information is an increasingly difficult first step as customers become conscious of their contact information privacy. Because of this, it’s essential to make use of contact information responsibly, in a valuable way and timely manner. Managing customer relationships over the phone is effective, but requires dedicated man power to be done correctly. Telemarketing isn’t flexible like email marketing, which allows the consumer to contact the dealership on their own terms. Email marketing can be automated, personalized and contextualized more easily than a phone call and measuring ROI efficiently is also a huge pro for email marketing. Plenty of free tools like Mailchimp, Constant Contact, Emma and more exist to help your dealership start leveraging your email list. 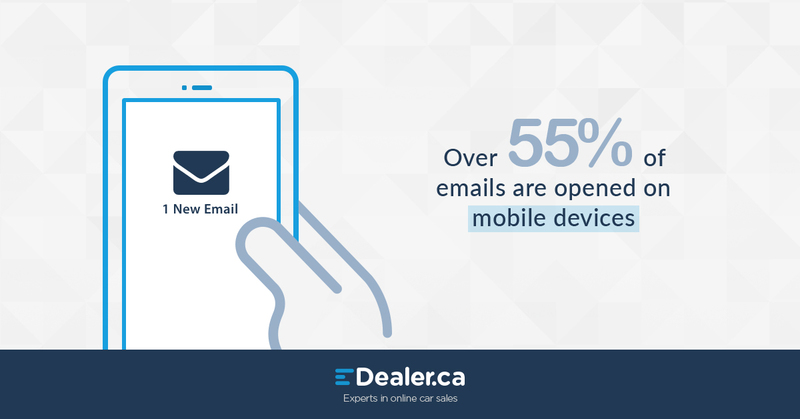 Recent data suggests that over 70% of car buyers would prefer to communicate with the dealership through email. Of those already communicating with dealerships via email, 58% wished they had a better, quicker response from the dealership (Think Auto, 2016). To boot, email is one of the most effective ways to reach shoppers on mobile. Email marketing doesn’t mean spamming your entire contact list general promotions, 2-3 times weekly. The tools above allow for contact list segmentation, email scheduling and personalization like addressing shoppers by name or sending a birthday email with a customized offer. These shoppers are considering buying a new vehicle sometime in the future. They probably shared their information with your dealership online and it’s unlikely they’ve visited the dealership in person. If they have it wasn’t a significant visit. Nurture them. Ask questions to better understand their interests and personalize future communications accordingly. A bit further down the funnel, these shoppers are actively researching and comparing vehicles. They’re reading and watching reviews online, chatting with their peers and have likely visited your dealership to chat with salespeople and take a test drive. Keep them engaged. Customize email based on their interest in model or vehicle type and share promotions that encourage shoppers to move toward the buying stage. The holy grail – shopper has become buyer. They’ve likely narrowed their decision down to a single make, 1-2 models and are deciding between dealerships. They’re willing to travel up to 55 km to buy. Close the gap. Make sure the decision is clear when buyers choose their dealership. Personalize email by referencing past communication, dealership visits and test drives. Share some photos and videos of the car the buyer is interested in right down to the colour and trim. Happy with their purchase, buyers are considering maintenance, service and if necessary repairs. They’ll consider the dealership, but will look to cheaper alternatives too. Keep the conversation going. The deal is done, but the relationship should live on. Referencing their purchase, ask how they’ve been enjoying their drive and if they’ve had any issues. Let the buyer know what your dealership can offer post purchase to influence lifelong and return customers. To ensure that your email marketing is being sent at the right time to the right people, make sure you integrate your email marketing with your CRM software. This is especially important for influencing decisions at the researching and buying stages, but shouldn’t be forgotten for the thinking and caring stages as well. Depending on your CRM software, maximize provided tools like templates, reminders and rules to follow up with shoppers or buyers. 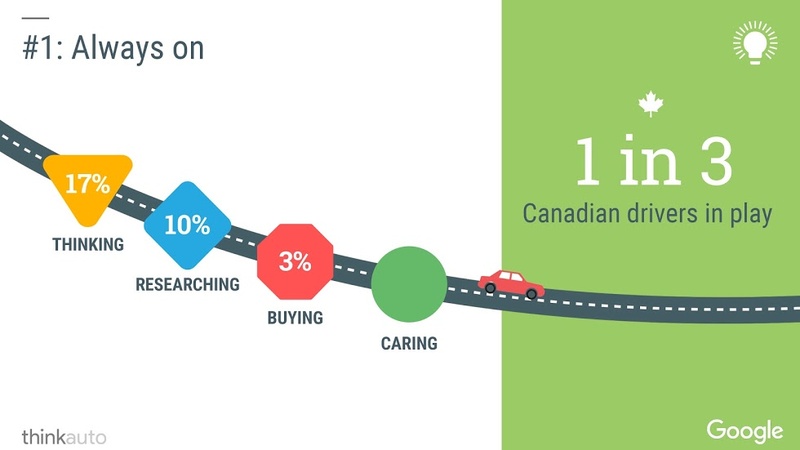 There’s nothing worse than missing out on a potential sale and ultimately lifelong customer because another dealership connected with the shopper consistently and efficiently to influence their buying decision.